Welcome and Merry Christmas my friends! 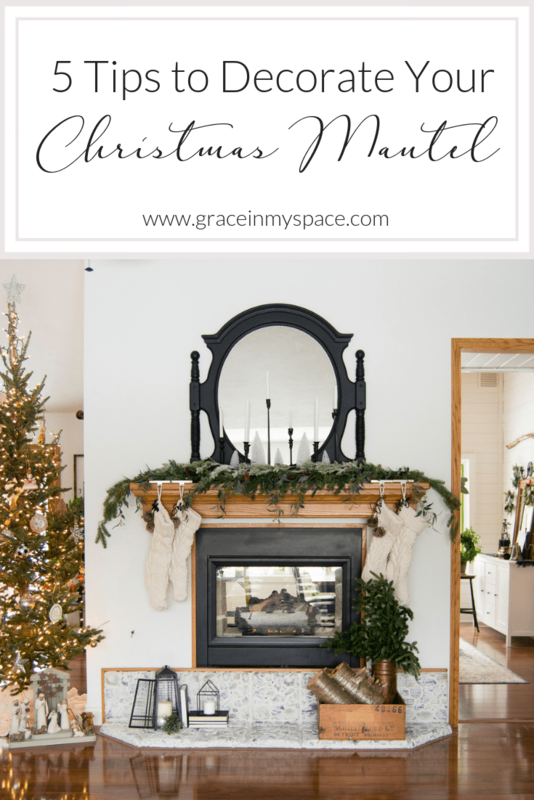 Today I’m sharing the first of my Christmas reveals with 5 easy steps to decorating your Christmas mantel. In the coming days I will have Christmas overload coming to the blog with lots of home tours and reveals. For now, make sure to peruse my Christmas DIY projects I’ve already tackled this year! This year I wanted to keep my Christmas mantel decor very simple. Working on my basement remodel zapped me of all my creative mojo so I chose to go with sparse decorations for Christmas this year. But I do love a lush mantel so I decided I’d play up the greens and keep the rest of the mantel decor super easy. 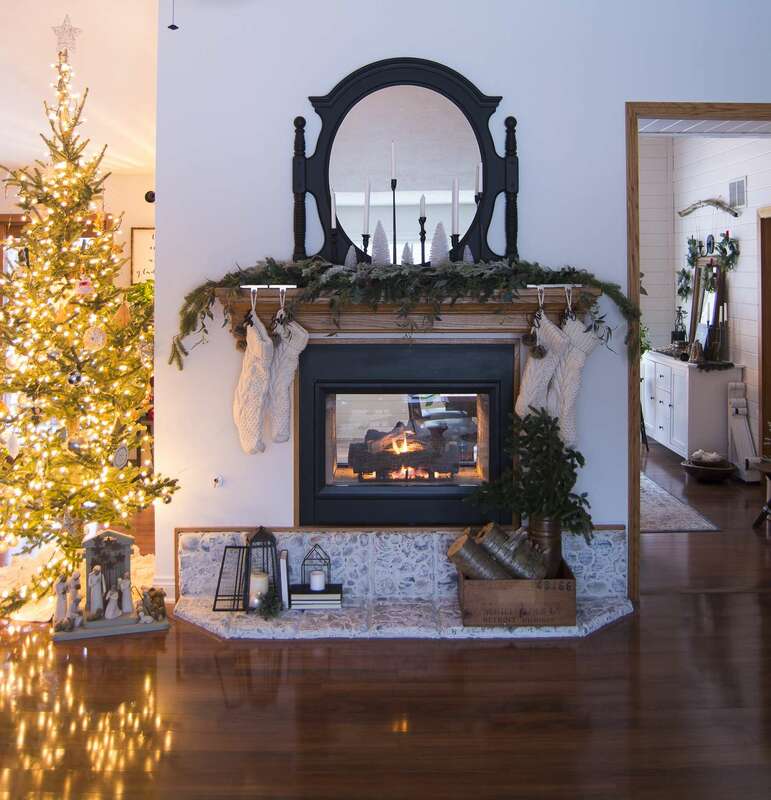 Here are some tips for decorating your own Christmas mantel! Layer your garland! My absolute must have for my mantel is greenery. I often get asked where I get my garland from and I’m never able to give a clear answer! Because…I kind of make it as I go! 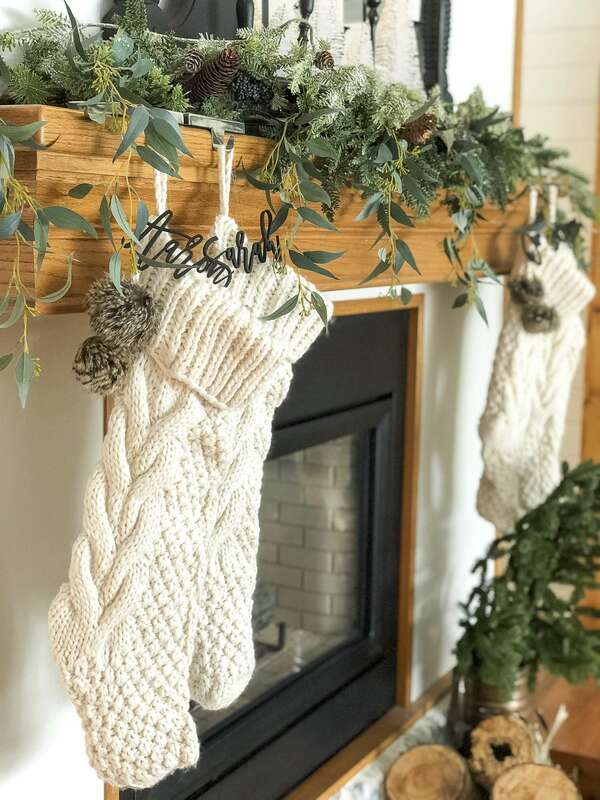 This garland consists of one long base garland (bottom pine), a smaller top garland (light green pine), eucalyptus stems from my fall decor, and two pine stems dangling on either side of the mantel. It is definitely possible to find super lush and long garlands, but they cost more than I’m willing to spend. Instead, I mix and match my greens and insert stems to lengthen and thicken the garland overall. 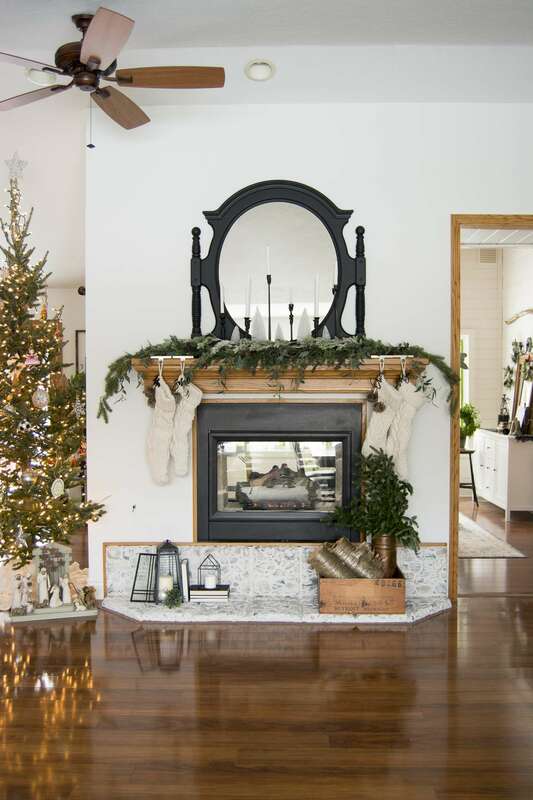 Choose a statement focal point to ground the mantel. 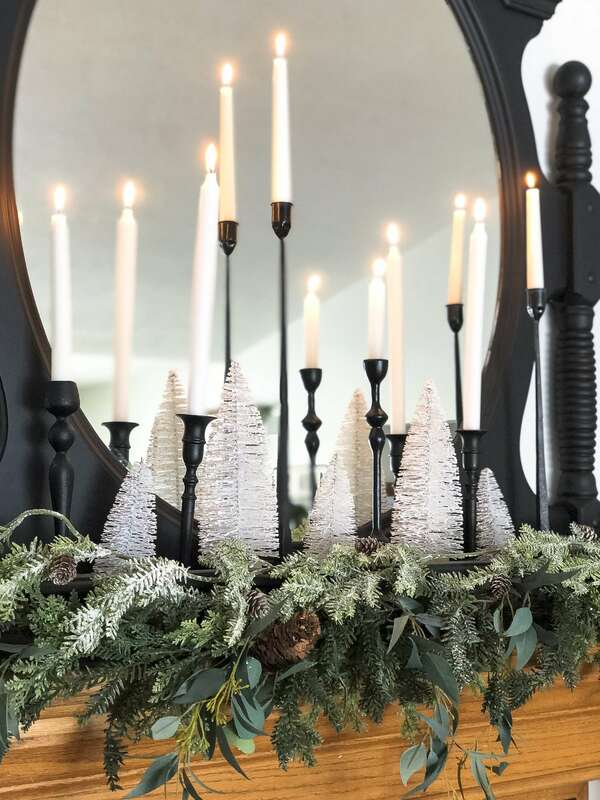 This dramatic mirror serves as the perfect backdrop for my Christmas mantel because it makes a statement! Can you believe I purchased this vintage mirror for $1?!?! I’ve painted it a couple of times and chose to go with black this year for a more dramatic effect against my neutral greens and whites. I’ve also used large signs, paintings or even my Christmas star from last year as focal points. I try to keep my focal point to one large piece but I’ve also loved seeing the layered mirrors many people are doing this season. Vary the height of your decor. I chose to use simple candlesticks this season that don’t detract from the simplicity I was looking for. By using several different sizes I easily added interest and drew the eye upward. Plus, these candles are beautiful when lit and reflecting off of the mirror. I also staggered in bottle brush trees for a festive touch. Notice that the heights of these are staggered as well. Personalization! Last year I had these beautiful wood cut outs made to personalize each of our stockings. I love going this route because I can add them to whatever style stocking I’m loving each year. Plus, my kids enjoy being able to identify which stocking is theirs and hanging their own stockings with pride. Don’t forget about the hearth! 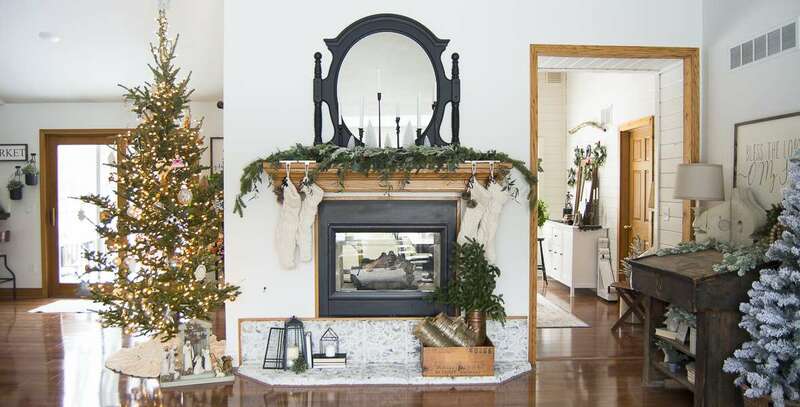 Whether you have a full hearth, a bench seat, or simple flooring under your mantel, you can add a few simple touches to make the entire space festive. You can see how I updated our small hearth from river rock to this European country style in my recent tutorial. 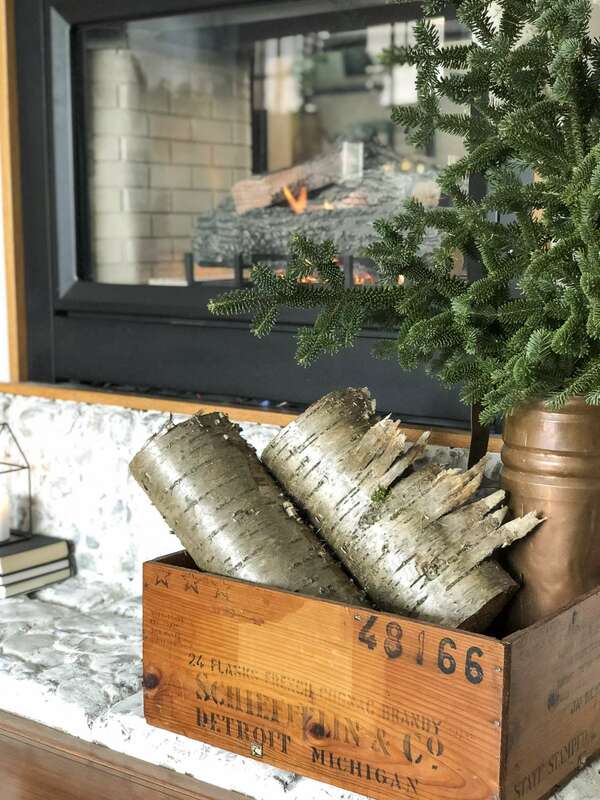 Cozy candles are an easy go-to for me, and my son and husband cut a small downed tree from our woods to mimic firewood. I also used the cut branches from our live Christmas tree to add to this copper vessel for a makeshift arrangement. If your stockings can’t be hung by the chimney with care then don’t despair! (…Yep, I’m a poet.) You can use these tips to decorate any flat surface. Considering using a foyer table as your mantel. Or perhaps you have an old picture ledge laying around…add some garland and simple decor to it! Maybe your dining buffet needs a little festive love. I’ve even seen people create a “mantel” on the footboard of their bed with beautiful greens and stockings. I hope that these simple steps are helpful to you! How do you decorate your Christmas mantel? Do you go all out or keep it simple? Thank you so much Carmen! I appreciate your kind words!